”Pet wellness is perhaps the most important part of canine ownership. Acquiring DNA breed heritage knowledge will help educate you about your dog and his or her special health and behaviour traits. You can be proactive about many of the important factors affecting the life of your dog. You will gain insight into the unique genetic background of your dog including the history of their breed, personality traits, exercise levels, and so much more! Click here to see what happens to 4 breeds over 2 generations! My husband and I have been dog guardians for over 30 years and have shared our lives with sporting dogs, terriers and herding dogs. Our Speaking of Dogs Rescue boy, Rudy, who was adopted in January 2005 has always been a bit of a mystery but best guess was terrier and perhaps poodle or bichon. Over the years we often wondered what his breed background was (there are many different terriers as we all know) – just out of curiosity as it really didn’t much matter whether he had Great Dane or Chihuahua. When we took him for pet dog training, the head instructor said to me, you look like you have a Westie mix there. Wow, I thought, she may be right. But, still, we didn’t know for sure. When walking Rudy we would meet other people walking their dogs and they would ask, “what breed is your dog?” we always answered “not sure, he’s an all Canadian” but always wondered what breeds may be lurking in his genetics. Until recently it was just fun to think about it. About a year after we adopted him, Rudy was becoming preoccupied with scratching himself, biting his feet, rubbing his face along the ground, all signs to me something was not right. We thought maybe he had fleas or a parasite but since we were diligent about keeping him flea and parasite free we doubted this was the cause which led us down the allergy path. We took him to our Veterinarian and found out he had atopic dermatitis and have since been referred to a Dermatologist. Since genetics can play a role in health issues in dogs as they do in humans, I had a good reason to test his DNA. Any and all additional information I can give the Dermatologist will help with the diagnosis. The DNA process was extremely easy. 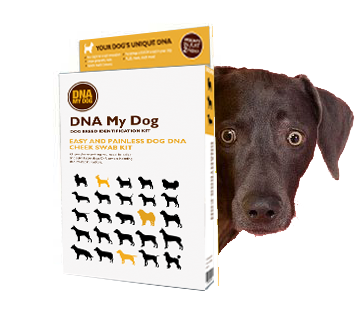 I went online at DNA My Dog and ordered a testing kit. I was pleasantly surprised by the $59.99 price tag. The kit arrived two days later. It seemed too easy to be true. There were two sterilized swabs (like Q-tips) and all I needed to do was rub one inside Rudy’s right cheek and the other inside Rudy’s left cheek. I then put the two swabs in a special envelope enclosed with the kit, let them air dry, fill out the information form including our contact info. and that was it. Off to the mailbox it went. I was amazed when one short week later, I had the results. I found out that my Rudy is, in fact, part Poodle and part West Highland White Terrier with a trace of Yorkshire Terrier in him for good measure. The health histories of both the Poodle and West Highland Terrier show a genetic tendency to atopic dermatitis, ah-ha! Now, I have some important information to pass on to the Dermatologist. I highly recommend this process if you look at your mixed breed and wonder “Who’s my Doggie”. Visit www.dnamydog.com for more information.